With the new United Nations (UN) and federal government grand plan to steal what remains of our land through the ruse of ecosystem management, there is one grand daddy that will take all of Idaho in one fell swoop. In 1944 the United States and Canada began talks to jointly manage the Columbia River which crossed the border. Both came to an agreement in 1961 creating a treaty that would provide flood control, generate hydropower, and meet irrigation needs. This treaty, known as the Columbia Treaty, was finalized in 1961 and implemented in 1964. Because the river crossed borders, called transboundary, it was also recognized as an “international treaty”. The agreement stipulated that Canada would provide water storage with dams, then be compensated for water release that generated hydropower. 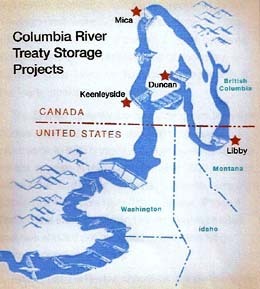 Although not specifically stated as a “basin” treaty, the treaty does reference the Columbia basin. This is a map of the Columbia River and Canadian dams, the river itself just barely touching Idaho. The Montana Libby dam was agreed to by Canada. This treaty successfully accomplished the goals of controlling flooding, producing hydropower, and irrigation management. In the treaty, for any potential unresolved disputes, the final decision could be referred to the UN International Court of Justice. How about that, no Idaho citizen has a say in the matter, but the UN does. In 1995 Canada created the Columbia Basin Trust (CBT). Somehow the Northwest Power and Conservation Council (NPCC) and the CBT refer to the river as the “International Columbia River“. The NPCC adheres to the Intergovernmental Panel on Climate Change (IPCC) science, you know, that UN organization. One CBT goal was to “…promote the social, economic, and environmental well-being in the Canadian portion of the Columbia River Basin.”, all three Agenda 21 pillars. After GHW Bush signed Agenda 21 (Chapter 18) in 1992, the U.S. Interior Columbia Basin Ecosystem Management Project began in 1994, under WJ Clinton, incorporating the same three pillars. Meanwhile, Canada also promotes sustainable development, aka Agenda 21. Although the treaty was intended to run in perpetuity one clause allowed both countries the opportunity to give ten years notice, starting in 2014, for unilaterally renegotiating or terminating the treaty. The flood control aspect expires in 2024, unless both reach agreement to extend it. The 2014/2024 Columbia River Treaty Review began in 2010, four years prior to 2014. The Bonneville Power Administration (BPA), operated by the Department of Energy, and the U.S. Army Corps of Engineers (USACE) planned workshops for public input. Do you remember being invited? Ok, so what, they are going to renegotiate the treaty. Well, it now goes way beyond that. Given the belief that environmental and social factors were not considered in the original treaty, being unfair to Tribes and the environment, negotiations must now include those factors. After all, we must remember our loyalty to Agenda 21 and the UN. The gimmick to do such? Ecosystems. All of these groups, agencies, and governments are now going to massively expand the treaty to include not just the river, but the entire Columbia basin. 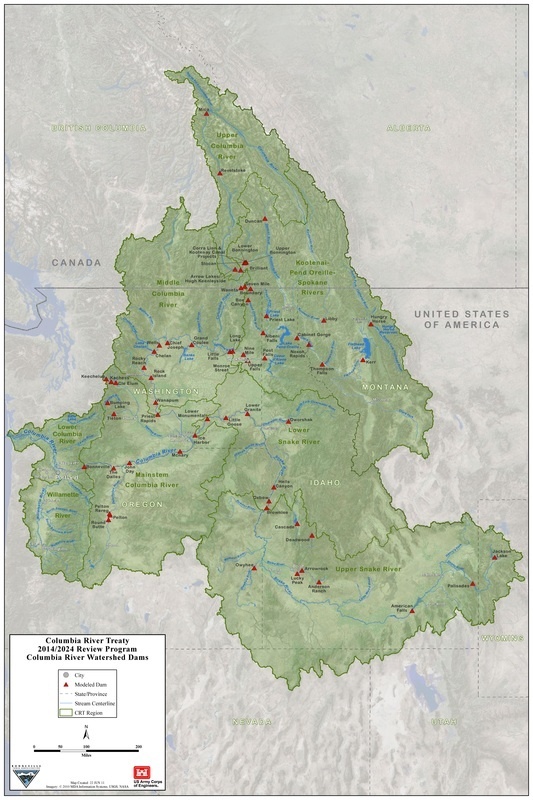 Here is the 2014/2024 Columbia River Treaty Review basin map. It clearly shows just how much area they plan to incorporate into the treaty with Idaho obliterated. Click here for larger view. As explained in the BLM posts, the agenda is now incorporating ecosystems into all decisions. This is the final tool that will kill all sovereignty over state and private land. Every species, habitat, wetland, watershed, river, insect, grass, bush, water drop, and more will need protection…there will be no justification for any one of us to use any land because of ecosystem damage we cause. Plus it gives reason to regulate private land, if you are lucky enough to possess it. A simple ecosystem definition is “the complex of a community of organisms and its environment functioning as an ecological unit”. Others make it more complex in that “…ecosystems themselves represent part of the earth’s biodiversity.”, and humans are destroying this biodiversity. In this description there is no mention of humans in the ecosystem environment. The Department of Interior (DOI), which manages the BLM, USFWS (pg 31),USFS, NPS (pg 19), BIA, and USGS among other agencies, has declared a more effective “mitigation” policy, defined as “…mitigation that includes the “preservation, enhancement, restoration or creation (PERC)” of areas destroyed in the name of progress.” That means you, human being, you have and continue to destroy land. The effort is “…attempting to establish a department wide mitigation strategy that will protect natural resources as the US prepares for an expected rise in development projects on public land.” This references the Resource Theft in the BLM posts, more land confiscation for the federal government to engage in renewable and other energy projects for land and energy control in partnership with foreign countries to redistribute our wealth. Here is the DOI 2014 mitigation strategy update with the cat out of the bag on renewable energy in the bottom paragraph. The BLM is already applying an Ecosystem Services Framework for Land Use Planning. Shocker. The UN Convention on Biological Diversity lists how federal government agencies are implementing their ecosystem restoration, USFS page 76, EPA watersheds page 83, and USDA agriculture/livestock page 85. The USDA, USFS, DOI, and BLM have been working on identifying the Columbia Basin ecosystem risks since 1997. 107 “layers” of information were analyzed using Geographic Information Systems (GIS). Throughout this document every map shows some type of ecosystem destruction, which means the only way to preserve or restore the basin is to control it. In 2003 these same agencies created a memorandum of understanding to “implement” the Interior Columbia Basin Strategy, updated in 2014. The strategy? “A Strategy for Applying the Knowledge Gained by the Interior Columbia Basin Ecosystem Management Project to the Revision of Land Use Plans and Project Implementation”. If the reader takes the time to read this document it becomes very apparent that there is no room for any human to use any of this land as it has to be protected or “restored” from human damage. Page 1 lists all the Idaho areas that will be affected. Ecosystems listed include landscape, habitat, forests, rangelands, riparian and other species, riparian areas, and Tribes. Since 2002 more GIS and Spatial Data have been collected on the basin for the purpose of eventual full control through ecosystem management. Here are the 8 chapters of ecosystem maps showing the numerous mapping details, including topography, hydrologic, vegetation, landscape, grazing, watershed, riparian, rangeland, ecology, roads, habitat, species, timber, economy, population, and reservations, naming just a few. Now that all of this data has been collected and strategies developed prior to the 2014 renegotiation start date, let the two countries begin talks. And, because the U.S. Department of State has a specific mission to the UN, they support incorporating ecosystem management strategies into the treaty. All groundwork has been completed to finalize the takeover of Idaho through a renegotiated treaty using ecosystem management. Agenda 21, Chapter 15 and Agenda 2030, Goal 15 address the need for ecosystem protection and restoration. There is also the UN Convention on Biological Diversity (signed by the U.S. in 1993) which outlines targets for ecosystem management by 2020. Did you read that? 2020, 4 years from now. It would be fair to say they are on the last leg of getting it done. Let’s see what else UN wants for ecosystem management. The United Nations Environment Programme (UNEP) envisions integrating ecosystem management into “ecosystem services“, providing “specialized expertise” for assessment, management, economics, and governance including international agreements, legislation, and policy. As part of the memorandum of understanding with UNEP, the Environmental Protection Agency (EPA) supports ecosystem services along with multiple federal agencies promoting the same. UNEP also has several booklets on ecosystem management if you would like to know more. The United Nations Development Programme (UNDP) also has an agenda for ecosystem management and created the Biodiversity and Ecosystems Global Framework 2012-2020 for countries to use as a guide. It can be downloaded to read. UNDP provides “technical and policy advice to governments” while promoting “Ecosystem-based Mitigation of & Adaptation to Climate Change”, currently being implemented by the DOI as previously noted. Again a 2020 date for framework implementation. One other UN organization, the International Union for Conservation of Nature (IUCN), of which the DOI is a member, has a special Commission on Ecosystem Management, including a Red List of Ecosystems the DOI can use, plus a transboundary water assessment and management program. Although not signed by the U.S. or Canada, the UN Watercourses Convention (UNWC) is recognized as the “most authoritative source of international water law”. The UNWC aims to be the global water instrument, the authoritative source of international water law, and create frameworks for water governance arrangements which includes transboundary water and ecosystem protection. If the U.S. signs this convention it will put the Columbia basin under further, and complete, UN rule. The United States Entity, comprised of the BPA and the USACE, released a document, Regional Recommendation for the Future of the Columbia River Treaty after 2024 on 12/13/13, meeting the UN regionalism goal. One noteworthy recommendation is on page 5, Ecosystem-based Function. This is a scheme concocted by the UN, justified by climate change scare tactics, and is really about taking final control over land, resources and humans. It is also called “Ecosystem-based Adaptation“, ecosystem based management, and can be separated out into different areas such as fisheries, mountains, and even disasters. This UNEP document gives a convoluted, scattered description of ecosystem based management on pages 4-5, almost as if they were trying to figure out how to justify a way to control everything. All four Idaho representatives, Risch, Crapo, Simpson, and Labrador urged the adoption of this treasonous document. The USGS sits on the U.S. National Commission for UNESCO’s International Hydrological Programme (IHP) with one interesting function, “Recommending U.S. programs for participation in the UNESCO International Hydrological Programme.”, and there are several programs. What this means for the hydropower generated by Columbia River dams is uncertain. It is difficult to ascertain just how the Columbia River Basin became “international“. But, being designated as such, it places the basin under International Waters Governance, as part of the GEF International Waters Governance Project. GEF stands for Global Environment Facility, financed via UNEP. Regardless, it also involves Idaho dams, so it will affect us as well. In the United Nations World Water Development Report 2016, everything you would want to know about how the UN will control our water is explained. On page 57-58 it describes changing our water use to a “green” economy which means industrializing our agriculture and urban water infrastructure as two examples, using UN business partnerships. This explains the Common Core emphasis on STEM and vocational education, preparing our children for the workforce needs of these industries. Pages 58-61 cover Agenda 2030 Goal 6 and related water goals. The UN will manage water through their Integrated Water Resource Management Plan (IWRM), which the Idaho Water Resource Board follows. Transition to renewable energy investment starts on page 83, addressing hydropower and urban infrastructure, which is why the UN bank partners are buying water utilities in preparation for the takeover. The Idaho Department of Water Resources was given a special mention on this page also. 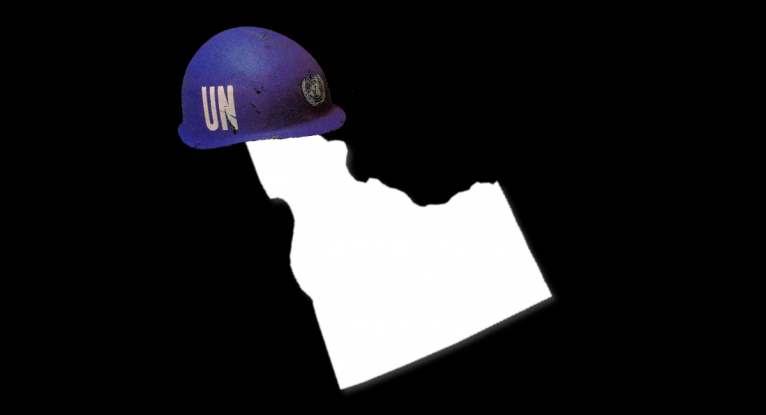 Yes, the UN monitors U.S. and Idaho water. Ecosystems are covered from page 26-28. The UN believes transboundary waters should be under international rule with focus on the “use, development, protection and conservation of water resources.” Since the Columbia Basin has somehow been declared international, it looks like the river is primed for UN take over. Briefly on the social pillar. As previously posted in the December, 2015 archives on Tribes being used by the federal government to take land and water from American citizens, Tribal rights are not being ignored in the treaty negotiation, including Idaho Tribes. Emphasis on salmon, tribal resources, and culture will be part of the talks, with full UN backing on Tribal water rights. If all of this gobbledegook has left you bored to tears or brain dead, there is a more simple explanation. The UN wants control of water, and they want it bad as water is the most valuable resource needed for everything. The intent is expanding the treaty to include the full Columbia Basin, not just the original river. With ecosystem management, defined by the UN and implemented by their federal buddies, public land will not only be affected, but private land as well. The goal is taking basin water resources, from basin water drops to storage, then controlling its use in agriculture, industries, and urban infrastructure, among other uses. Forcing Idaho into a “green economy” means expensive technology will be needed for redesigning water use in all areas, and the federal government taking more land for their renewable energy projects. UN business partners, many of them banks, will be investing in this green technology while the federal government will ban land use and take private land away through regulations causing economic devastation, what they are doing to ranchers. Agricultural farmers will be next. Common Core will educate your child to those new industrial technology needs. The UN has multiple water partners supporting this agenda. Ecosystem data is made available to UN business partners so they can take advantage of energy projects once we are stripped of our land. 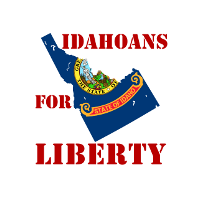 Idaho will soon die, there will be nothing left of our state. This will truly be the death of Idaho. The UN controls our forests, government agencies implement UN objectives on our land, our cities are being redesigned by the UN, we are being forced off our land into cities, children are being indoctrinated on UN ideology…there is nothing left but ecosystem management to finish us off. Our water will be taken and controlled, we will be told where and how we can enjoy the outdoors, if at all. Jobs will be determined by UN corporate industries. Yet Idahoans don’t listen, state legislators refuse to address this out of the fear it looks like a conspiracy. It is not a conspiracy, it is right there in front of everyone. And we do nothing. Shame on us, shame on us. We should be in the streets demanding our legislators remove us from every illegal, treasonous, unconstitutional regulation that each corrupt federal agency forces on us, and demand that there will be no implemented UN objective in our state. We should be yelling at the top of our lungs that if this is not done, we will remove each legislator, and keep going through them until we find one that has the courage, and the love of Idaho, to do as we tell them, not ask, tell them. When will we be ready and have the courage to do this? We have 4 short years, the UN has given us the year. When?